The LNG Hybrid Barge is being eagerly awaited at the Port of Hamburg. On September 5, 2014, the technical launching was celebrated in Komárno, Slovakia. “This is an important day for the shipping industry, because the LNG Hybrid Barge is a big step forward for supplying cruise ships with environmentally-friendly energy,” said Dirk Lehman, Managing Director of Becker Marine Systems. 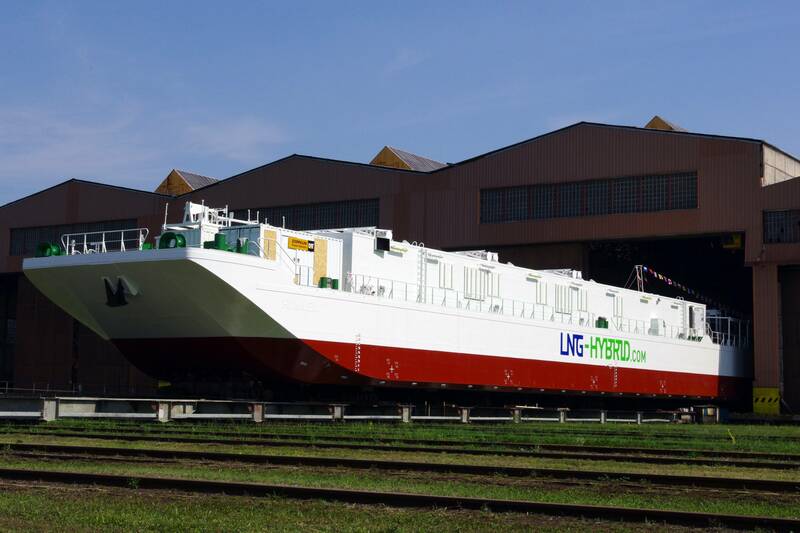 Starting off from her place of construction, on September 12, 2014 the LNG Hybrid Barge with a length of 76.7 m, a breadth of 11.4 m and draught of approx. 1.7 m will be making the 1,500 km journey up the Danube, Main and Rhine rivers north towards Hamburg. Once there, technical testing and commissioning will be taking place at a shipyard. Following a naming ceremony in mid-October, the LNG Hybrid Barge will for the first time be delivering energy to a cruise ship as part of a joint project with AIDA Cruises. Thanks to Becker Marine Systems, Hamburg will thus be the first port in Europe to be providing an external, environmentally-friendly and low-emission power supply to cruise ships. Liquefied natural gas (LNG) is a fuel that will enable the heavy fuel oil-powered generators on ships to be switched off during layovers at port. This will prevent the release of toxic emissions. 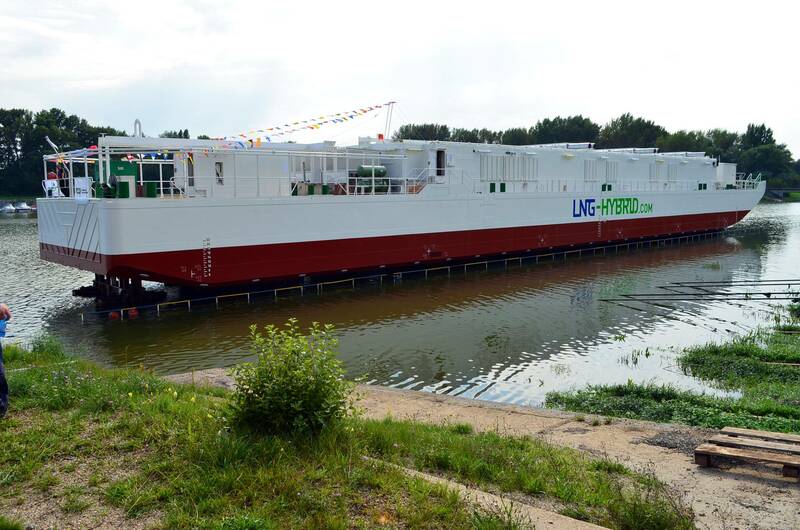 Delivered only two years after the start of the project, the LNG Hybrid Barge is equipped with five generators with an overall output of 7.5 MW (50/60 Hz). These generators will be the first marine classified LNG Caterpillar engines to be delivered to customers.